Samsung's Galaxy Note 8 has a big 6.3” screen, a beautiful design and a super expensive price tag, which means the last thing you want to do is scratch it, drop it or smash it. That means you need a case and you need one now. The good news is, even though it’s a brand spanking new phone, accessories manufacturers have caught on fast and created a range of cases to suit all budgets and personalities. There’s a lot of choice when it comes to getting the right Samsung Galaxy Note 8 case, so making sure you choose the right one for you is important. If you want to throw your handset into your bag and get it out to call clients and respond to emails every few minutes, you’re going to need a durable case that’ll withstand your business needs. If you prefer your phone to look good before you take a photo of your fancy food, you can opt for a case that prioritises style over safety instead. But don’t worry, we’ve done all the hard work for you, tracking down ten of our favourite cases for your Galaxy Note 8 whether you’re looking for something slim and barely-there or durable and able to withstand even the clumsiest of hands. The Galaxy Note 8 is a great-looking phone, so we totally understand if you don’t want a bulky case that’ll hide its features and design. The Air case from Ringke is one of our favourites because it pairs a crystal clear cover with TPU bumper and corner cushions for protection against most minor bumps and scratches. Like a lot of the cases on this list, as an added bonus this one also supports wireless charging, which means you don’t need to keep taking the case off to juice it up. This minimal yet multi-purpose Nubuck case from Poetic has a TPU inner shell under a perforated leather back card case, which is functional and professional. It also has a pull-tab design to give you easy access to your bank cards and it’s still slim enough to slot into your handbag or back pocket. You can choose from a small selection of classic colours, including navy blue, black and brown. This is a glittering, stylish take on the original Air case from Ringke, which boasts a TPU bumper and corner cushions for protection against most minor bumps and scratches. The main difference is the geometric design on the front and the glittering finish - be warned, it’s really shiny. Just like the regular Air cover from Ringke, the Air Prism supports wireless charging, so you don’t have to take it off to charge it up. Before you go hunting for a new case for your Note 8, take a look at what Samsung has been working on case-wise recently. One of the most minimal choices is the sleek Clear View case, which provides great all-round protection without adding too much unnecessary bulk. It has a semi-transparent front cover, so you can keep tabs on incoming calls, battery life, messages and the time without having to flip it open. The surface is fingerprint resistant, anti-scratch and the material ensures it’s Qi wireless charging compatible - so you don’t need to keep removing it. Samsung has been working on some great cases for the Galaxy Note 8 and this is one of the most versatile because it’s just so simple. The Alcantara case has a super slim fit to keep the Note 8 looking and feeling slim and light. It also has a suede-like feel that feels great but is also stain-resistant and super durable. It comes in a range of colours, including khaki, pink, blue, black and grey. Most smartphone cases boast about having two to three levels of protection, but this super serious Monarch Feather Light case from Urban Armor has five, including metal hardware, top grain leather, a honeycomb traction grip and a soft shock-absorbing core. This means it meets military standards for drop and shock protection and comes with a 10 year limited warranty. If you like the look of more classic, sophisticated accessories, then the K3 wallet-style case from Obliq is ideal. Made from premium synthetic leather, it has 3 interior card slots, 1 interior side pocket and 1 more easily accessible card slot on the outside. Its wallet style means it’s protected with premium materials on both sides, keeping scratches at bay. It’s also compatible with most wireless charging ports, so you don’t have to remove it to get juiced up. The Plyo Series from Urban Armor comprises of a really hard armour shell and then a soft core inside to absorb any shock from knocks or falls. To cushion your smartphone against drops, there’s built-in air cushioning in the corners of the case, as well as a protective lip surrounding the edge of the screen. The case is also Samsung Pay and wireless charging compatible, so you won’t need to keep taking it off to use the phone’s full features. The Olixar Armourdillo is made from a lightweight TPU polymer for maximum shock absorption to keep your smartphone safe after knocks and falls. It’s called the Armourdillo because it has a touch “exoskeleton” made from polycarbonate plastic to protect against impact. It also has a textured finish in order to improve grip, as well as a stand to watch movies and TV shows on-the-go. The Neo Hybrid case is comprised of two layers, a metallic bumper that keeps the edges of your phone safe from knocks and falls, and a TPU cover to absorb shock and provide maximum grip. It’s pocket-friendly due to its super slim form factor and it has specially designed raised cutouts to better protect your screen and your camera. This multi-purpose case provides 3m of drop protection thanks to Tech21’s FlexShock technology, as well as a thin and lightweight style built for slim pockets and ultra portability. The case looks understated with a geometric pattern and tactile feel that means you’re less likely to drop it, and it’s made from a scratch and UV-yellowing resistant coating so it’s likely to age well. Sure it’s on the higher end of the price scale, but it looks good, adds minimal bulk to your new Note 8 and protects against most drops and scratches - proving your gran was right, you do often get what you pay for. 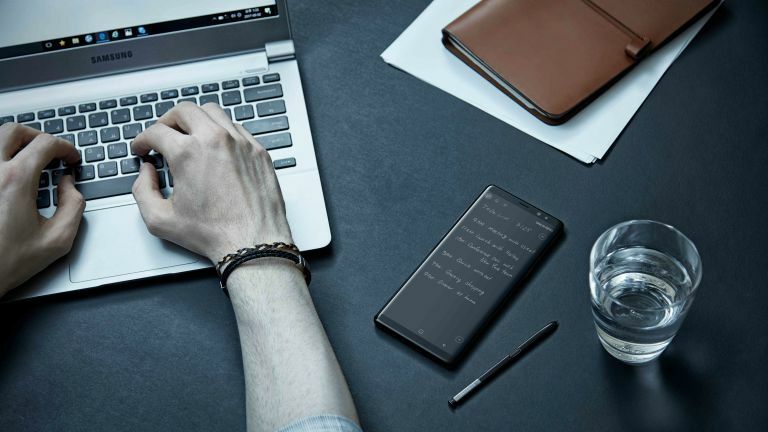 This official case from Samsung may look simple at first glance, but has an innovative way of keeping you up-to-date while keeping your handset protected - a great-looking, minimal LED display. The wallet-style case closes over the screen of your Samsung Galaxy Note 8 to keep it safe from scratches and scrapes. Inside there are slots for cards, and on the outside the LED display can be controlled with a swipe without opening it up. As you might expect, you’ll be paying a premium as the case is directly from Samsung and comes with the added display on the front. If you’re more keen on classic rather than cutting-edge case styles, this Vintage wallet case from Snakehive will suit you. It’s crafted from naturally distressed, European nubuck leather on the outside, which the brand promises will age over time to reveal the smooth texture and darker tone you get with quality leather. The inner cover is made from a softer leather to protect your screen from scratches and features three credit card slots, as well as a large compartment for notes, meaning the case is good-looking as well as practical. This case boasts a dual-layered structure consisting of a flexible TPU (thermoplastic polyurethane) body and rigid PC (polycarbonate) outer shell, which is tech-speak for twice the protection. Thanks to air cushion technology, the Tough Armor case withstands impacts and meets military standards after a series of drop tests. The even better news? For a case built with durability in mind, it’s surprisingly slim and has a built-in kickstand so you can prop your handset up as you catch up on Netflix. If you want basic protection for your phone but you’re on a budget after splashing all of your cash on the Note 8 then the Olixar Flexishield is for you. At under a fiver it’s super cheap but still provides protection from knocks and scratches in a slim, great-looking package. We wouldn’t advise you carrying out a drop test with this one, but we’d hope you wouldn’t need one because it has a gel exterior with a non-slip coating that makes gripping easier. The DualPro from Incipio is another case that boasts two layers of protection, one on the inside that’s more flexible for absorbing shock, and a hard polycarbonate exterior made for durability. The case has a raised bezel around the edge as well to ensure that the case protects the body and the lovely new curved screen of your new Note 8. Unlike many of the other cases on the list, the DualPro comes in a range of colours, from the darker Merlot and Midnight Blue through to candy shades Rose Quartz and Turquoise, all with a soft touch finish that looks great and is much better to grip than shinier alternatives - perfect if you’re accident prone. If you’re looking for a way to keep your Note 8 safe from scratches, but you also want it to look good, then the super affordable Onyx case from Ringke combines superior protection with a futuristic-looking brushed metal exterior. It has a shock absorbing bumper around its edge, as well as tapered lips round the front and back to further protect both your screen and your camera from any mishaps. You’ve just spent a small fortune on upgrading to a Galaxy Note 8, so why would you want to cover it up? Luckily the Rugged Crystal case from Spigen is designed for those who just can’t get enough of the smooth edges and beautiful design of their new handset. It’s transparent, slim and super streamlined, but it’ll also keep your phone protected with reinforced corner guards and raised bezels round your screen. It may not be quite as tough as the other options on this list, but like Spigen’s other case, it’s passed military-grade drop tests so gets a big thumbs up from us. The OtterBox brand is well-known for its high standard of durable accessories and its popular Defender style case has now been crafted for the Note 8. Although this simple black Defender Series case looks plain and understated, it won’t win any beauty contests, but it does often come top in the durability stakes. The Defender case won’t just protect against knocks and scrapes, it’s also going to keep your new Note 8 free from dust and lint thanks to port covers. Most of the cases currently on the market for the Note 8 are all about durability and protecting your handset from knocks and scratches. The Damda Glide from VRS is no exception, with a bumper case and hardshell construction. But it stands apart from the rest because of its spring-loaded sliding compartment, which makes it tough as well as functional. It comes in a range of bold colours, including Blue Coral, Shine Gold and Cream White.